Over recent years, there have been growing concerns about the parlous state of religious education in England. There is a lack of clarity over the purpose of the subject, patchy provision, high levels of non-specialists expected to teach the subject, and substantial evidence of increasing numbers of schools failing to fulfil their statutory obligation to provide RE, particularly at Key Stage 4. A succession of reports has highlighted the need for reform. The most recent subject report from Ofsted, in 2013, noted that six out of ten lessons in RE were less than good, and called for a review of RE’s legal status in order to help raise standards. One of the key challenges for reform is RE’s legal status. There is a statutory obligation for schools to provide religious education, although the subject is not part of the National Curriculum. The Curriculum for RE for Community Schools and Voluntary Controlled Church of England Schools is set locally at Agreed Syllabus Conferences and overseen via Local Authorities through SACREs. Academies, free schools, and independent schools are not required to follow the locally agreed syllabus, and arrangements for RE in schools of a religious character can be different again. The increasing number of academies has put severe strain on SACREs and there is a high likelihood that much of the SACRE system will soon crumble without intervention. Should this happen, there would be very little to define what RE was and no structure to oversee the RE that was taking place in schools. 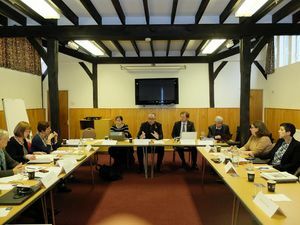 Responding to the threats to high quality RE, the RE Council decided to establish an independent Commission on Religious Education (CoRE) to review the legal, education, and policy frameworks and to make evidence-based recommendations for change. CoRE has been asked to produce an interim report in mid-2017 and a final report in mid-2018. To take part in our survey please click here. 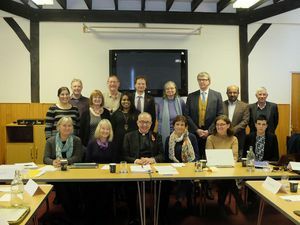 The Commission on Religious Education has been formally established with 14 Commissioners appointed under the Chairmanship of the Very Revd Dr John Hall, Dean of Westminster. The Commissioners have been drawn from a wide range of backgrounds. They include two leading headteachers, a primary and a secondary RE teacher with impeccable credentials, academics from disciplines including theology and sociology of religion, a curriculum expert and a former lead on RE form Ofsted, specialists in RE teacher training, experts in community cohesion, school governance, human rights law on religion, and religion and the media. All Commissioners have been appointed as individuals and not as representatives of any group. Collectively they encompass a breadth of different religion and belief backgrounds. The Dean of Westminster, the Very Revd Dr John Hall. He is the former Chief Education Officer of the Church of England, and former Diocesan Director of Education in Blackburn. He is Chair of Governors at Westminster School and Harris Westminster Sixth Form, a Free school. Samira Ahmed, Journalist, broadcaster and Visiting Professor of Journalism at Kingston University. She presents Front Row on Radio 4 and Newswatch on BBC1 and a range of cultural and religious programmes and documentaries across BBC and Radio. These have included Something Understood and Sunday on Radio 4 and BBC1's religion and ethics discussion show Sunday Morning Live. Alan Brine, HMI in Ofsted from 2001 to 2014 and National Adviser on RE from 2007 to 2014. He is author of many key publications on RE, including the most recent report from Ofsted, Religious Education: Realising the Potential (2013) and the key Church of England survey report on RE in Church Schools, Making a Difference (2014). Previously he was a teacher of RE in schools and HE, and County Inspector for RE in Hampshire. Professor Denise Cush, formerly of Bath Spa University. She is an expert in Buddhism, Hinduism, Christianity and alternative spiritualities, RE research and initial teacher education. She is a former teacher of Religious Studies in a sixth form college, and a former trainer of both primary and secondary teachers in religious studies. Esther Deans MBE, Humanities Lead at Malmesbury School. She is formerly an initial teacher training Associate Tutor for Bath Spa University and Bristol University. She is a member of the Race Equality in Education steering group in Bristol, Chair of the Stand Against Racism & Inequality and Chair of Bristol SACRE. Professor Sir Malcolm Evans KCMG OBE, Professor of Public International Law, University of Bristol. He is a former member of the Organization for Security and Co-operation in Europe (OSCE) Advisory Panel on the Freedom of Religion or Belief and currently Chair of the UN Subcommittee for the Prevention of Torture. Dame Helen Hyde, Former head of Watford Grammar School for Girls (since 1987). She is a commissioner on the National Holocaust Commission and Chair of its Education Committee. President of Freedom and Autonomy, National Schools Association (FASNA). She is a Fellow of the Royal Society of Arts and a trustee of the Holocaust Education Trust. Emma Knights, CEO, National Governors’ Association. Prior to her appointment to the NGA in 2010 she was joint CEO of the Daycare Trust. Before that, she worked in a number of roles in the voluntary sector, particularly in the Legal Services Commission, Citizens Advice and the Local Government Association. Juliet Lyal, teacher at Cunningham Infants School with extensive experience teaching at junior and infant level. She is a member of Hertfordshire SACRE and is a member of the writing group for the Hertfordshire Agreed Syllabus. She has national experience supporting local RE groups, having founded the St Albans RE Teachers Together group. She is a Statutory Inspection of Anglican and Methodist Schools (SIAMS) inspector. Dr Joyce Miller, Associate Fellow in the Religions and Education Research Unit at the University of Warwick (WRERU). In 2007 she retired as Head of Diversity and Cohesion at Education Bradford, prior to which she was a Senior Lecturer in religious studies at the University of Wolverhampton. She taught in secondary schools in Coventry and Northumberland. She is the former Chair of the RE Council, AREIAC, Bradford SACRE and the Schools Linking Network. Professor Eleanor Nesbitt, formerly of University of Warwick. She is an expert in the religious socialisation of young people of Christian, Hindu and Sikh background, and in qualitative research methods. She is author of Sikhism: A Very Short Introduction (2005). She is formerly a teacher of RE in schools in England and India. Between 1986 and 2007 she trained secondary RE teachers and non-specialist primary teachers at the University of Warwick. She has served on Coventry SACRE. Dr Vanessa Ogden, CEO of the Mulberry Schools Trust, a Multi Academy Trust. She taught religious education for many years and served on Ealing SACRE. She has contributed to curriculum development in RE nationally, and has tutored on the MA programme in RE at the Institute of Education. She is a Visiting Fellow at the Institute of Education and she has a doctorate specialising in education policy and school improvement. Dr Farid Panjwani, Director, Centre for Research and Evaluation in Muslim Education, UCL Institute of Education. He has published widely on the aims, curriculum and pedagogy of religious education. He has worked on several curriculum and teacher education projects in religious and inter-cultural education. He has a wide range of experience of teaching religious education in formal and non-formal settings. In addition to the UK, he has taught courses in universities in Italy, Canada, Tunisia and Pakistan. Dr Anthony Towey, Academic Director, School of Theology, Education and Leadership, St Mary’s University, Twickenham. He lectured in Rome, Durham and Birmingham before leading the RE department at Loreto College. He is an Ofqual subject specialist and has assisted in the shaping of the Religious Education Reforms at A-Level and in particular by developing new specifications and resources at GCSE with AQA and Eduqas.